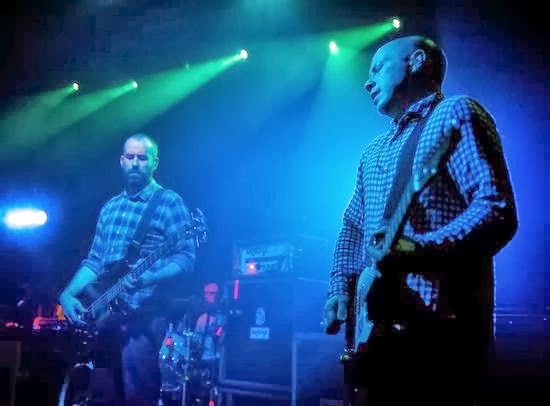 The first thing which strikes you about Mogwai's live show isn't their visual impact, stage presence or sheer volume, but rather the mountainous technical setup by which they're surrounded. Opening their latest world tour at the Newcastle's Mill Volvo Tyne Theatre, the Glaswegians adorned the stage with stacks of keyboards, synths, drumkits and no less than 40 effects pedals; while their guitar tech sweated for his money, frantically readying fresh instruments for each and every new song. The quintet themselves, meanwhile, thoroughly justified the price of admission in a display of poise and proficiency very much befitting one of post rock's definitive acts. With Rave Tapes fresh on the nation's shelves, it was no surprise that the new album occupied a sizable chunk of their performance, often at the expense of established big-hitters. That weighty presence, though, was more than vindicated by its fruits' impact, with the vocorded ripples of 'The Lord is Out of Control,' the cathartic 'Deesh' and the pulsing rhythmic menace of 'Remurdered' making for many of the night's highlights. What's more, their inclusion brought a fresh electronic element to the group's awesome sonic barrage, the power and fullness of which truly shines through when amped-up before an audience. This applies not only to epic crescendos but also more subdued moments like Come On Die Young's 'Ex-Cowboy' while another '90s number, 'Ithica 27-9,' offered a striking reminder of the quiet-VERY LOUD dynamics which punctuated those early days. Signing off with the monstrous riff-fest 'Batcat,' their appearance left bleary eyes, bludgeoned eardrums and a sense that no matter what they play, this two-decade-old force remain a formidable live proposition. A word too for long-term acquaintance Aidan Moffat, who opened with a brief yet typically entertaining autoharp-aided solo set. A Scottish legend in his own right, the former Arab Strap man incorporated wicked humour, the rarely aired 'I Would Have Liked Me a Lot Last Night' from his band's debut album, and even an exert from his children's book, due to be published later this year. Don't let your tots become too acquainted, though - this, after all, is a man who's banned his own son from seeing him live until he's 16! Mogwai's eighth LP, Rave Tapes, is out now. Read our review here.